An opportunity to visit New York City became the opportunity for The Freadom® Road Foundation’s President Maria Hayley to visit the New York Public Library. On Thursday, November 29, 2018, she was happily “lost” in the treasure trove of this world-renowned institution. “Knowledge is Power” proclaimed the signs everywhere. Scientist, philosopher, writer and Lord Chancellor of England, Francis Bacon (1561-1626) said it first – and these words have rung through the centuries ever since. Access to knowledge through literacy skills, home libraries, independent reading and connection to public libraries is a founding principle of the Freadom® Road Foundation in pursuit of its mission to break the cycle of intergenerational incarceration. Opening a road to access to knowledge is critical and begins right at the beginning of life. 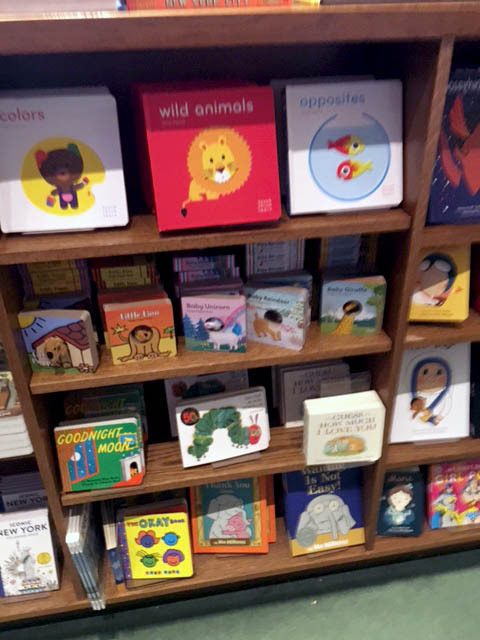 This photo of a New York Public Library display of classic baby board books underscores our founding principle of the critical need for access to knowledge “ab initio” – from the beginning.